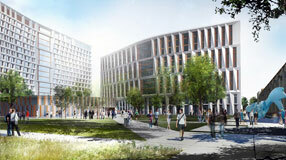 A new residence hall and dining commons, designed by Studio Gang Architects, will be a hub of undergraduate life. For Marilu Henner, X'74, it's like her entire life happened yesterday. Jewel C. Stradford Lafontant, JD'46, was a lawyer and public servant who broke many barriers. Phoebe Maltz Bovy, AB'05, enters the fray over Hilary Mantel's comments about Kate Middleton. The Computation Institute's Rayid Ghani creates a fellowship for aspiring data scientists to work for the common good. UChicago student Sue Khim creates Brilliant.org to give underprivileged students around the world access to difficult math practice problems. An opportunity to expand his franchise lured the data journalist Silver, AB'00, away from the New York Times. Rosanna Warren, the Hanna Holborn Gray Distinguished Service Professor, fears the cultural impact of diminished liberal arts education. Thomas, JD'70, assumes the post as head of the judiciary in England and Wales in October. We're looking for readers with the spines to stack up against the competition in the Magazine's latest contest. All entries must arrive by midnight Sunday, August 4--no excuses, no extensions. Leading economists discuss their research in a series of videos from the Becker Friedman Institute.